Restaurateur David Ramsden has spiced up the Edinrbugh restaurant scene in 2008 by opening the dogs, a gastropub focused on British cuisine. Its assured and exciting food at affordable prices has helped it earn one Michelin star in 2011, and it is worth a mention that all the seafood is sustainable and is sourced from Fife and Caithness. With so many stuffy and overpriced restaurants in big cities these days, the dogs is a real gem for great-value food and wine in a chilled, down-to-earth environment. 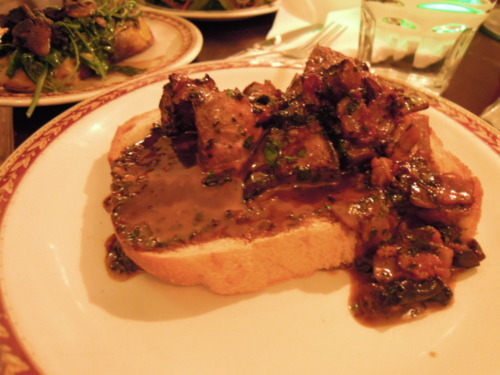 (1) We started off with the devilied liver, onions, bacon and mushroom on toast, which had a terrific symphony of flavours. 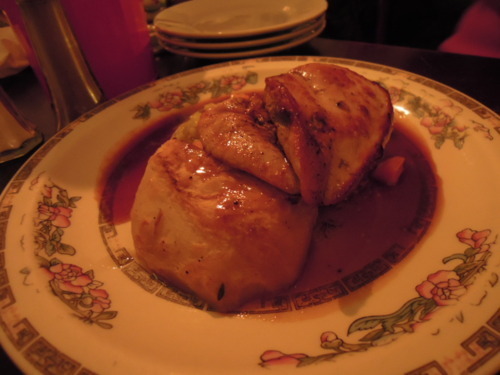 The devilied liver was tasty and punchy, and all the ingredients held together marvellously. (2) The roast chicken breast with black pudding hash and creamed leeks was another delightful surprise: the seasoning was unimpeachable, and the mellow taste of the chicken formed a magnificent contrast with the more intense flavours of the black pudding hash and leeks. 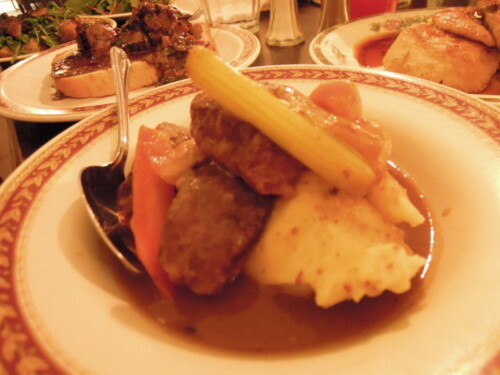 (3) The third course was the pig’s cheek and cider stew with mustard mash, which again demonstrated the kitchen’s ability to churn out scrumptious British dishes. The pig’s cheek was decadently soft and supple, perfectly complementary with the mustard mash, while the cider stew left a soothing aftertaste. 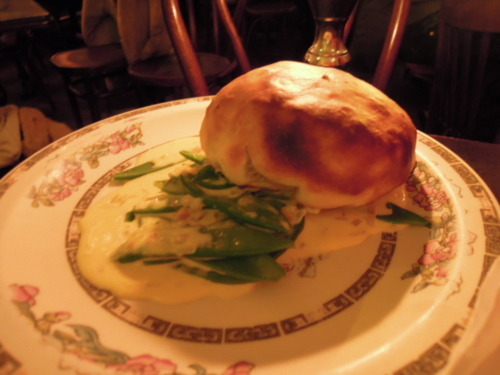 (4) A Welsh Rarebit is a piece of toast with melted cheese on it (see here for a receipe). 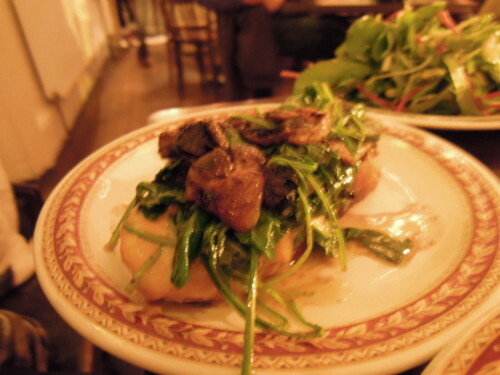 Even though our stomachs could barely handle the generous amounts of food at the dogs, the fact that we polished off this welsh rarebit on toast with mushrooms and rocket was a sign of how moreish this dish was; the harmony of flavours and the warmth of the toast was greatly satisfying. (5) It was our first time eating haggis, which is a savoury pudding usually containing sheep’s heart, liver and lungs, minced onions and spices. The dogs created a veggie version of it – the homemade veggie haggis and mushroom bake – and it turned out to be the star of the night! Even though there was no meat, the flavouring was natural and intense. Served piping hot from the kitchen, every bite of this haggis was sheer deliciousness. 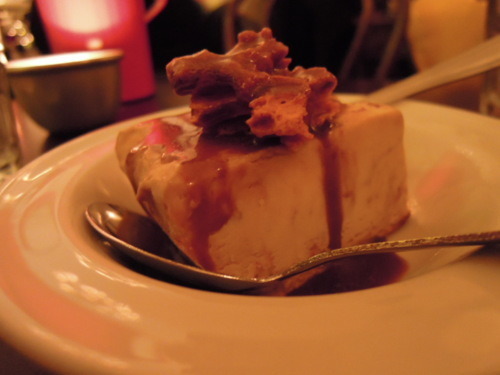 (6) The honeycomb parfait with toffee sauce was an instant addiction. The honeycomb parfait was fantastically sweet and creamy, and the toffee sauce was an added bonus. 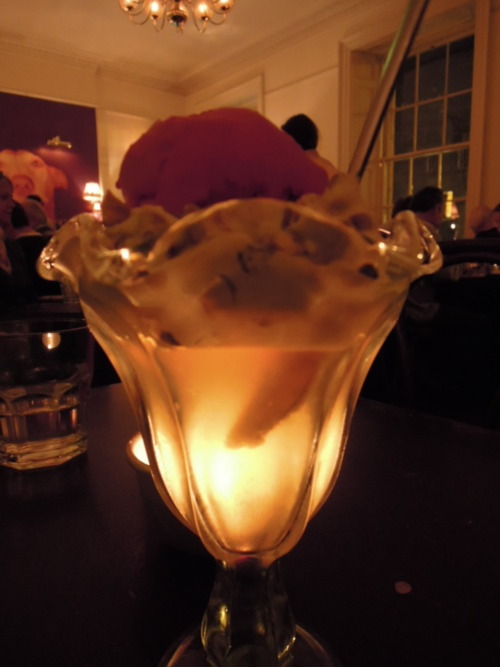 (7) The whiskey jelly, oatmeal cream with raspberry sorbet left a deeply favourable impression. The three layers of the dessert offered an interesting mélange of flavours, and the whiskey jelly, in particular, added much zing to this wonderful dessert!